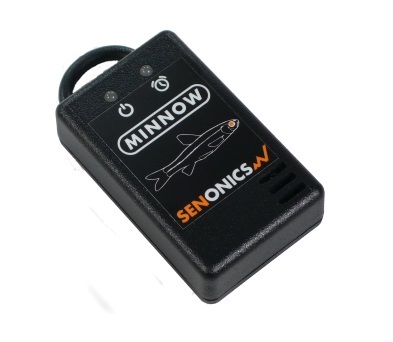 Minnow 1.0 is the most compact logger offering from Senonics. Suppose for example you would like to transport some delicate or fragile cargo from one location to another. 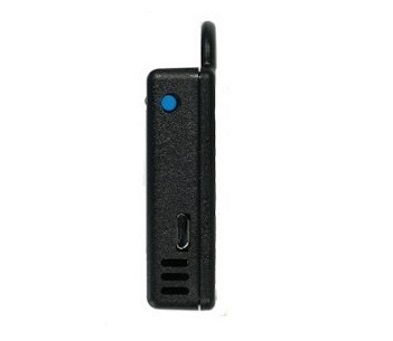 By attachment of a Minnow 1.0 logger one can record temperature and humidity conditions during the journey. At the destination you can then extract the logged data using a very simple PC application and see graphically or in raw data format the changes in environment over time. 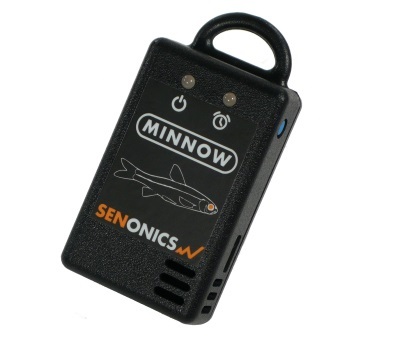 Minnow 1.0 offers accurate and repeatable logging for temperature and relative humidity. Temperature is measured to an accuracy of +/- 0.3C over the range +5C to +60C and +/- 2.0C over the full range -30C to +80C. Relative humidity is measured to an accuracy of +/- 2.0% over 20% to 80% humidity range and +/- 4.0% over 0% to 100%. Both temperature and relative humidity are logged at a user configurable logging rate which can be set in a PC application program. 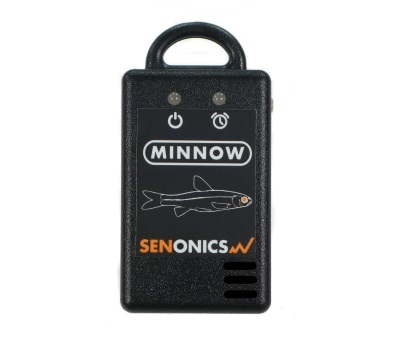 Minnow 1.0 is available with an optional NIST traceable single point calibration at any temperature between 15C and 35C or 0C. 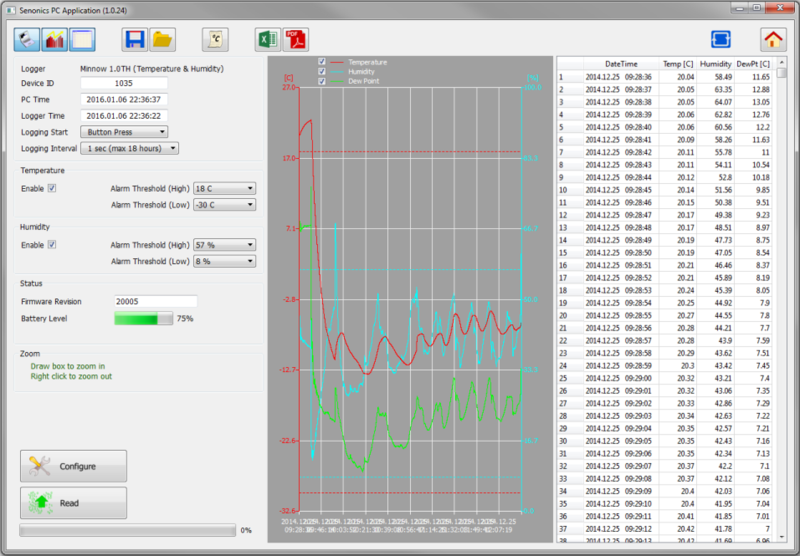 Once calibrated Minnow 1.0 is accurate to +/- 0.1C within +/- 20C of the calibration point. The Minnow 1.0 logger is equipped with the largest logging memory when compared with comparable portable logging devices currently available. The Minnow 1.0 logger has provision for an impressive 65520 storage items each of which is a time-stamped recording of temperature and humidity. The Minnow 1.0 logger enables each device to have a 16 character name. This can be helpful when the user has multiple logging devices and one would like to distinguish between them for example based on location. Logging data may also be password protected so that data may only be retrieved from the device by supplying a user supplied password. Minnow 1.0 runs from a single CR2450 coin cell better available from supermarkets or online battery stores over the internet. The logger can log temperature and relative humidity for up to 4 years. Minnow 1.0 comes with a very easy to use PC application. The application is used for configuration of the logger, extraction of logger data, graphically viewing of logging data, spread sheet analysis of logging data and saving of logging data to file (typically in comma separated value CSV file format) for third party applications such as Microsoft Excel. The graphical user interface is completely intuitive in terms of configuring new devices and extracting logging data from a field device. When the user has multiple devices requiring the same setup then one can preload the application with a logger setup from a saved configuration file to help expedite the process and ensure all loggers get setup identically. The application does not require any driver installations to connect to your logging device. Just download the program from our home page, run it and then plug in you device. As simple as that! Currently the PC application is available for Windows XP, Vista, Windows 7, Windows 8 and Windows 10. It is also supported on Mac. The Minnow 1.0 design is compact, elegant and simple. Care has been taken to ensure the design is stylish and only makes available buttons, indicators and connectors which are intuitive and uncomplicated. Minnow 1.0 has a handy key ring attachment for easy transportation.